This empty wood case is ideal for storing our bullion necklaces and diamonds. The wood is stained in black, and the top of the case is see-through to display the contents. The inside is lined with black velour to protect your investment. A decorative gold coloured clasp holds the case shut. 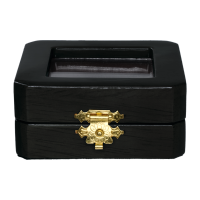 תיבת תכשיטים ריקה לשרשראות This empty wood case is ideal for storing our bullion necklaces and diamonds. The wood is stained in black, and the top of the case is see-through to display the contents. The inside is lined with black velour to protect your investment. A decorative gold coloured clasp holds the case shut.